Is 2019 Your Year for Romance? Kick it Off Right with 20 Inch Sparklers! The new year is almost upon us and winter romance is in the air. Maybe it's the sights and sounds of the holidays, the beauty of the snow, or the joy of the season, but many new relationships seem to blossom at this time of year. Is 2019 going to be your year for romance? If it is, you might find it convenient to have a supply of 20 inch sparklers on hand to help you celebrate the special moments in your relationship and make them just a little bit more memorable. What better way to ring in the new year than at the side of your new love watching the ball drop? How about a big party celebration with tons of friends and a bucket full of 20 inch sparklers from the Wedding Sparklers Outlet? Our sparklers burn for approximately 1.5 to 2 minutes and feature easy to light tips. Picture this: the ball starts to drop, everyone lights up, then 10, 9, 8, 7... 3, 2, 1 and kiss under a shower of golden sparks — what a wonderfully romantic way to ring in the new year. Ah, Valentine's Day, the most romantic day of the year. Roses, chocolates, romantic candlelit dinners and the steady shower of golden sparks from our wedding sparklers at your table. Our sparklers burn virtually smoke-free and are safe for use indoors. For something completely unique, replace the candles on the cake with some of our cake sparklers, smokeless and food safe, so they can add a final touch of romance to this celebration of love. Along with our standard wedding sparklers, why not add our heart-shaped sparklers to the end-of-the-night kiss? Birthdays are always the perfect time to show your significant other how much they mean to you. It's also the perfect time to replace those boring old candles with our cake sparklers for a refreshing change. These come in two sizes, 4-inch and 6-inch, they burn for 30 and 50 seconds, respectively, and are safe for use on cakes and many other foods. If you are serving wine or champagne, order our bottle toppers and add one or two of these sparklers to the bottle after you open it. When your wedding day arrives, there are many different ways you can use our wedding sparklers to add more pizzazz to your special day. Our 20 inch sparklers can be used in the church to light up the aisle for the bride as she approaches the altar. Create a wedding arch of our 36-inch sparklers to light the newlyweds' way to the limousine that will take them to the reception. 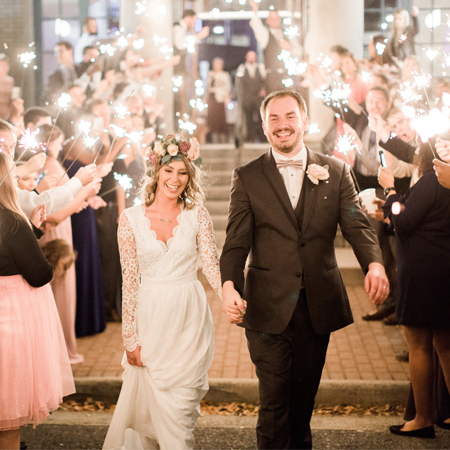 At the reception, our wedding sparklers are perfect for lighting up during the toast, and more importantly, to light up the happily married couple as they step out on the dance floor for the all-important "First Dance." At Wedding Sparklers Outlet, we carry a large selection of sparklers, sparkler tags, and confetti cannons to help you celebrate the important events in your life.